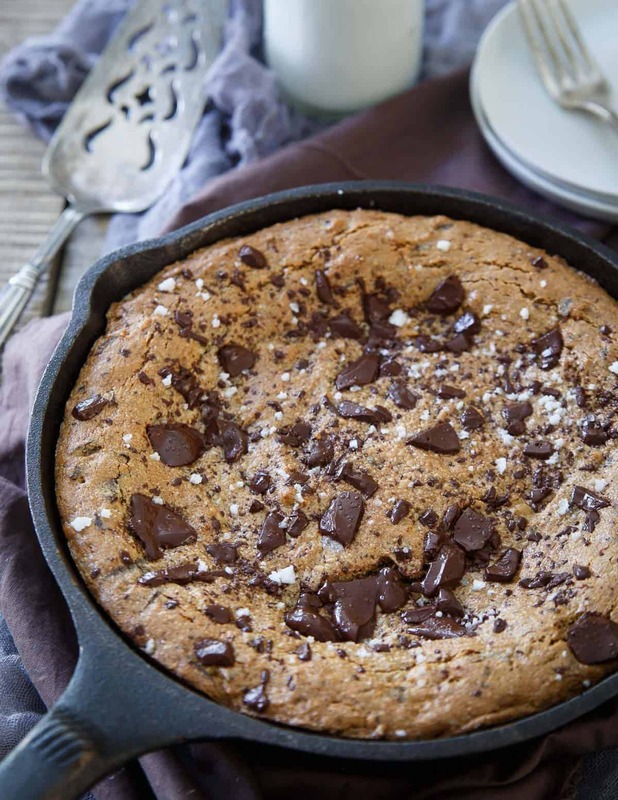 Check out how easy this paleo cookie skillet is in this quick video above. Subscribe to my YouTube channel for more quick and easy recipe videos. Despite years of knowing this and doing it countless times over, I still think it’s absolutely crazy that you can use a nut butter as a base for baked goods instead of flour and they actually turn out! Blows my mind every time. This time was no exception either and while I knew this paleo salted chocolate chip skillet cookie would turn out, I still sat there like a little kid in front of the oven door with my fingers crossed hoping it would bake up ok.
My willpower has been pretty on point over the last few months when it comes to eating things I shouldn’t be. Well, this recipe ruined me. The second pictures were done, that slice you see in the last picture below couldn’t get in my face fast enough. And then there was another small forkful, and another…and maybe another 5 minutes later after trying to walk away from it. The only thing that saved me from face planting into the skillet itself was wrapping it up and promptly bringing it to the gym where it was attacked like people hadn’t eaten in a week and fought over for who got to take home the leftovers. Words really won’t do this one justice. It’s decadent and chocolaty with crispy edges and a seriously gooey center. The sea salt on top makes each bite pop with that perfect salty sweet goodness and using cashew butter instead of another nut butter gives it an almost cake batter like undertone. I LOVE cashew butter for that and literally never walk out of Trader Joe’s with less than 3 jars of it at a time. Running out would honestly make me cry. 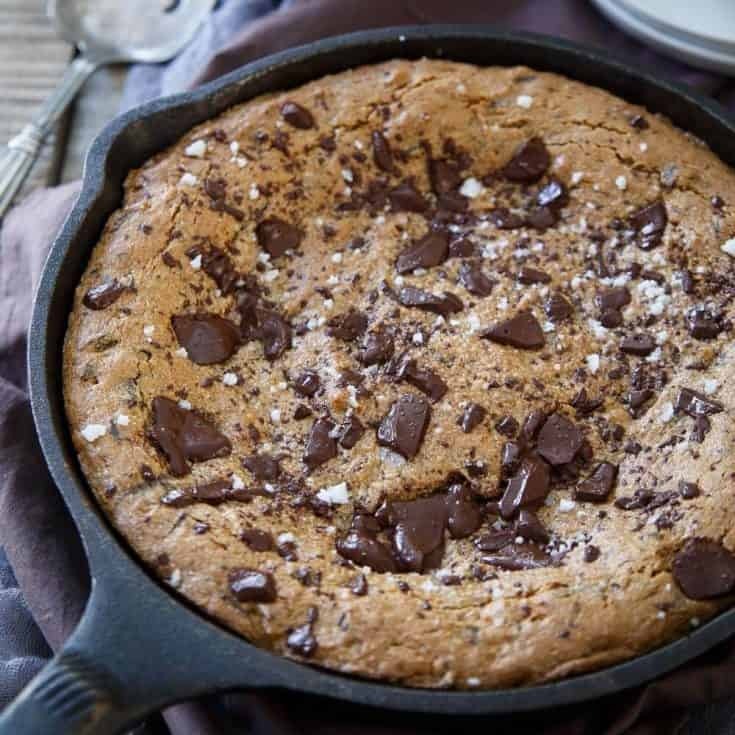 Between this paleo salted chocolate chip cookie skillet, this fudgy paleo skillet brownie, these paleo chocolate chip cookies and maybe these paleo BACON chocolate chip cookies you really don’t need any other paleo dessert recipes as far as I’m concerned! Make this. Eat this. Fall in love. Grease an 8 inch cast iron skillet with coconut oil or butter. Combine cashew butter, eggs, coconut sugar, baking soda and coconut oil in a large bowl. Stir well until mostly combined. Add chopped chocolate and mix until well incorporated. Transfer mixture into the greased skillet and spread out evenly. Top with additional chocolate and a sprinkling of sea salt. Bake for 20-25 minutes until golden brown around edges and still a bit loose in the middle. Oh my, this sounds yum! 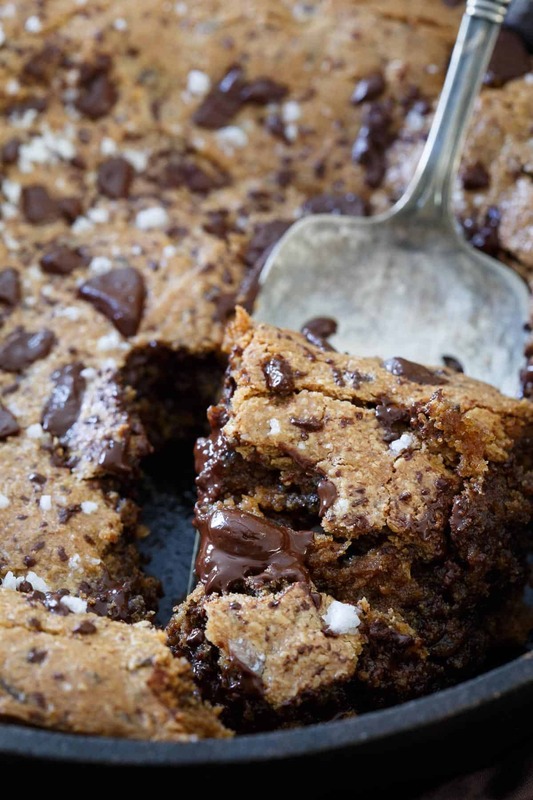 Cookie skillets are enough for me to drool, and salted chocolate chip seems like a dream come true. Thanks for sharing this! Thank you! This recipe is so useful and looks delicious! It is kind of crazy that nut butters can be transformed into a baked good, isn’t it? And in many cases I actually prefer these baked goods over their flour counterparts. Almond butter is my typical “go to” (I can’t get enough of the stuff). . .but being the big cashew fan. . .I’m thinking I might need to switch it up a bit with cashew butter because this cookie looks absolutely heavenly. I can practically taste it just be looking at the photos. I love TJ’s cashew butter too, it’s a pretty decent price and it’s just so good! This looks dangerous and I think i would be tempted to eat the whole thing in one sitting! Oh my, this looks good! Thanks for sharing. Do you think I could substitute almond butter? I was about to ask the same thing! We have a cashew allergy over here but almonds are ok! Cant wait to try this. Looks easy to make and delicious! Love this recipe! Any nut butter? Does that include peanut butter? Yes, pb would work just fine as well. This looks delicious and I LOVE cashew butter! Wow this tasted delicious! Thanks gina! Is it bad that I want to eat the entire skillet? this looks amazing!! do you have a favorite brand or place to get your cashew butter? I usually buy (and love!!) Trader Joe’s cashew butter. You should be able to find it these days in regular grocery stores, definitely natural food stores and if all else fails, Amazon. Where are people finding cashew butter at a reasonable price? It’s like buying gold here! Do you have a Trader Joe’s nearby? It’s not that expensive there. If not, Amazon is your best friend. Or, just use a different nut butter. We do have a Trader’s, I’ll check there first, I know at Whole Foods it ridiculously expensive. Thanks for th eAmazon tip as well. if the dough is any thing like the cookie will be, it will be AMAZING. wow thanks for such an easy yummy recipe!! I don’t have a skillet. would a pie plate or cake pan work? Nope, you don’t need a skillet! A baking dish of any sort will work. Baking time may be a tiny bit longer, just remove when edges are firm but middle is still soft, it will set up a bit as it cools. That’s really hard to diagnose without being in the kitchen with you. Did you follow the recipe exactly? After making it multiple times, dry is the last thing I’d ever say this recipe is. It’s quite gooey actually. Sorry you had trouble with it! Do you think I could use an egg substitute, like flax or chia eggs (or Bob’s Red Mill gluten-free egg replacer)? I’m not so concerned with it being strictly Paleo. Great question, I haven’t tried but in theory, it should work! If you do try it, please let me know how it comes out. As soon as I’m done my Whole30 I am making this!!! Do you make your own cashew butter or buy it? I usually buy it at Trader Joe’s, it’s so cheap there it doesn’t make sense not to! No offense, but coconut sugar isn’t paleo or Keto. I never said it was keto and it is paleo it’s just not whole 30. Thanks. I stand corrected on The keto. Someone had posted it on a Facebook keto group. I have never seen any kind of refined added sugar described as paleo. It’s still the same composition as table sugar. I want to make this for my sons birthday but only have a 10 inch skillet. What do you think about me doubling it?? If so, I’m curious about the cook time. If you do it in a 10 inch, you might want to bake a few minutes less as it will be spread out thinner. I wouldn’t double it unless you have a much larger skillet, even still, probably best to make 2 skillets rather than 1. How do you think it would work to substitute the coconut sugar with granular stevia? Honestly not sure. I don’t tend to bake with stevia but if you do and know the ratio for subbing it into recipes instead of using “real” sugar, I’d give it a shot. Ok, thanks! I’ll give it a try and let you know how it goes!